Kathy flame lamp simulates natural flame, flickering flame light bulbs, no open flame, safe and energy-saving LED light source. Atmosphere lighting, family holidays, gatherings, and gifts, this decorative light bulb is essential for every household. Decorative bulbs, warm flame colors make your home look cozy and give you a quiet, romantic moment. 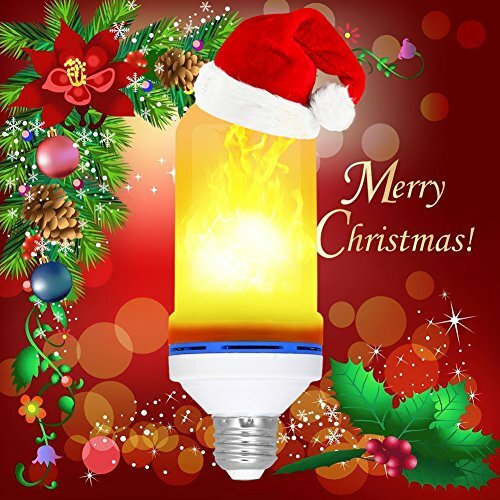 Safe & Green Energy Saving: This led flame lights has excellent heat dissipation, no harmful substances, no UV or infrared radiation, Eco friendly. E26 easy install and apply to any country. Save 90% of electricity compared from traditional flame bulbs. Application: Great for Bedroom, Living Room, Outdoor Gardens, Villas, Home decoration, Bar, Hotel, Restaurant, Coffee shop, Night Clubs, Wedding decorations, Party, Church, Castle and more. 【What you get】1pcs flame light bulbs, 50000 hours life span, 6 Months warranty and our fan-favorite friendly customer service. Set The Mood With These LED Light Bulbs That Look Like Real Flickering Flames.